Neville Brown has authored twelve books or major reports, including The Future of Air Power (1986). With the award-winning Future Global Challenge (1977), he began to give economic, social and ecological factors salience in the quest for a peaceable world. This thrust has continued with New Strategy Through Space (1990) through to Global Instability and Strategic Crisis (2004). His History and Climate Change, a Eurocentric Perspective (2001) reviews the last two millennia. In 1990, Professor Brown was elected a Fellow of the Royal Astronomical Society. His latest book is Engaging the Cosmos: Astronomy, Philosophy, and Faith (SAP). This book is mindful of Geography’s big dilemma. How can the subject curb the encroachments of other disciplines: environmental studies, human ecology, political science, geophysics . . . ? The author believes that what we know as “strategic studies” needs urgently to address a clutch of geography-related considerations customarily seen as outside its remit. Climate change is of singular import, security-wise. Moreover, other pressures on our planetary ecology and resource base, currently appear as critical, taken collectively. Societal and philosophic contradictions are deeply endemic, too, not least within the modern post-industrial nations. Again the attendant security implications may lend themselves well to geographical interpretations. Informing the study throughout will be an awareness of the interactions between Space and Time, addressed not metaphysically but in mundane terms. Then again, while linear distance and bearing are becoming less crucially important, the two-dimensional aspects of geographic space (areas and densities) are becoming more critical. Germane, too, is the medium-term (20 to 30 years?) prospect of biowarfare displacing nuclear bombs as the most menacing form of mass destruction. The classical Chinese concept of yin and yang will be examined as lending itself to singularly fruitful application to conflict limitation in an ever-shrinking world. Throughout a distinction is preserved between those questions the author believes can be answered definitively, and those which as yet can only be aired. For both, historical experience will be evaluated in order to give more depth to the interpretation of modern challenges – actual and predicted. Emphasis will be laid on the development of regional associations strong enough to deal with various aspects of a survival strategy: nuclear deterrence, peacekeeping, arms control, developing economic resources, rural and urban ecology. A final review concludes with how one might hope a planetary community can evolve in the longer term – i.e. up to one or two centuries ahead. Neville Brown has used his vast knowledge of history and geography in a fascinating way to give us deeper insights into how these key influences on human life have combined to shape our course. At this time we should be thinking widely and challenging familiar boundaries of thought. Brown leads the way with a very important book. I commend it warmly. ‘Geopolitics’ is a much misunderstood term that is over-used in modern politics. Neville Brown puts geopolitics back where it belongs – as a scientific and particular way of interpreting world politics that offers both explanation and meta-prediction. And he does so in a way that is both delightful and impressive. On the basis of a lifetime of scholarship and an eye for the fascinating and amusing he offers a sweep of history, culture and science that is as breathtaking as it is riveting. If students of global politics are frightened of being changed simply by reading one book, they should stay away from this one. It will stretch and convert them in a single reading. Professor Brown’s scope is extremely wide. Its historical span extends from proto-human to modern times, its geographical throughout our troubled planet and the Inner Space around it. Many threads are brought together to consider present and future circumstances: the strategic balance shifting eastwards; the displacement of Cold War rivalries with new antagonisms; accelerating change in technology, ecology and demography; failed or failing states… Those involved in or otherwise concerned about the difficult decisions we face, strategic and economic, will be far better informed for having read this impressive book. Neville Brown was already a leading figure in Strategic Studies when today’s decision-makers were undergraduate students. A lifetime in the field has qualified him, almost uniquely, to paint ‘the bigger picture’ by integrating history, geography and strategic analysis into a continuum which broadens horizons as it deepens understanding. Brown applies concepts from geography to past, ongoing, and potential conflicts that matter to people and institutions beyond the combatants. His organizing themes are the roots of modern strife, world strategy, the eastern question, and the western question. 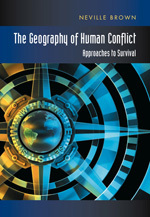 More specific topics include acquiring the globe from Miocene to Iron Age, European Renaissance and reconnaissance 1492–1942, the Soviet experiment, intercontinental deterrence, biowarfare within the strategic revolution, global warming, whether the Fertile Crescent in a critical region, and survival geography. This is the final part of a trilogy that began with Engaging the Cosmos: Astronomy, philosophy and faith (2006), and continued with The Geography of Human Conflict: Approaches to survival (2009). In it, Professor Brown achieves a magisterial review of the contemporary threats on the world stage to the integrity of social liberalism. It is an erudite and eclectic survey as befits a senior scholar who has made major contributions to disciplines as diverse as strategic studies and astrophysics. Its appearance is particularly appropriate at a time when the significance of internal and external threats from terrorism is self evident. Professor Brown read economics and geography, and then modern history, when he was a student, and this breadth of interests is apparent in the present book which explores evolutionary legacies from the time of the earliest hominids to the present. ... It will appeal to advanced students and their teachers in the fields of human geography, politics, citizenship and world history. Sub-themes include risks associated with climatic change and biowarfare. There is a short but poignant case study of what the author calls the ecological collapse that has occurred in the area around Watlington in Oxfordshire which was his boyhood home. The book is clearly written in an engaging, committed and jargon-free style. The referencing is exemplary, and will be very helpful for teachers. This is an informative, thought-provoking work, and deserves a wide audience.